· Publishing Company: OXFORD University Press. · What is the genre of the book? (the kind of book- comedy, action, mystery etc.)? The story happened in 221B Barker street and the Alpha, a pub . Dr Watson It’s a friend of Sherlock Holmes. Sherlock Holmes is a detective. Peterson is a doorman. Mr Henry Baker is the owner of the hat and goose. Countess Morcaris is the owner of the blue diamond. John Horner is a man who repairs the windows. Mr Windigate is the owner of the Alpha Pub. Mr Breckinridges is a man who sells geese. James Ryder is the man who stole the blue diamond. Somebody stole the blue diamond from the Countess Morcar . The police thought the window man stole the blue diamond. Sherlock Holmes wants to find the real thief. The doorman found the hat and the goose. He gave the hat to Sherlock Holmes and he took the goose to for him self. Then the doorman found blue diamond in the goose. He took it to Sherlock.Then he started on this case. After that he saw a weak little man shouting at Mr Breckinriges about his goose. Sherlock asked him about his name. 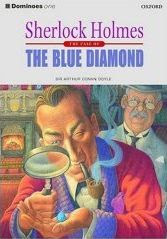 Then the little man said “I well told you about every thing”.He said he stole the blue diamond from Countess Morcar.Police thought the window man stole the blue diamond.Then he went to his sister and she had a farm. He went on the farm and thinking where he will hide the diamond. He have a goose to his sister. After that he decided to put it into the goose.After that his sister sold all the goose to the Mr Breckinridges. So he was there to tell him to retune his goose. James Ryder was sorry and he wont do it again. He asked Sherlock “please don’t tell the police”. Sherlock said “that’s not my job”. Ryder was afraid Sherlock told him Christmas is a time to be nice to other people. · How is the problem solved at the end of the story? Sherlock Holmes found the thief and now he will not do some thing wrong again. · What was the best thing that happened in the story? Why do you think so? When the doorman found the blue diamond in the goose because its imposable to find a diamond into a goose. · What is your opinion of the book? Give reasons. It’s a wonderful story because the criminal knows his fault and he will not do it again.